Merton offers careful critique of all three postulates. Review of the second postulate of universal functionalism, which holds that all persisting forms of culture are inevitably functional, resulted in other considerations which must be met by a codified approach to functional interpretation. 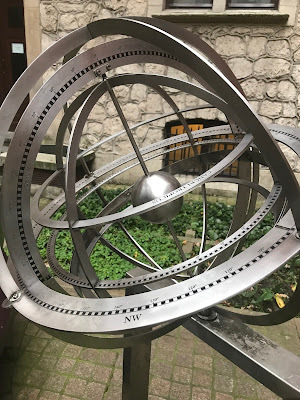 It appeared not only that we must be prepared to find dysfunctional as well as functional consequences of these forms but that the theorist will ultimately be confronted with the difficult problem of developing an organon for assessing the net balance of consequences if his research is to have bearing on social technology…. Merton draws an important distinction between manifest and latent functions -- between the directly observable beneficial consequences of a given social arrangement and the indirect and unobservable consequences that the arrangement may have. These passages demonstrate that Merton’s relationship to functionalism is complex, and the functionalism that he endorses is not the a priori methodology advocated by earlier theorists. 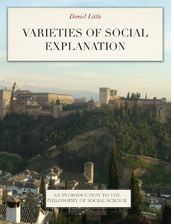 However, he accepts the basic idea that we can explain (some) social features based on the positive consequences they create for the social system or important parts of the social system. The idea of sociological functionalism has been substantially discredited in sociology. 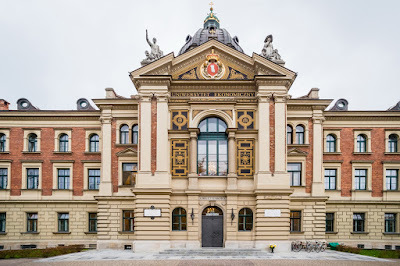 Functionalism maintains that social features -- institutions, values, laws -- have the characteristics they possess because they serve important needs of the social order. Or to put the point the other way around, a social order comes to have features that are functionally well adapted to serving the needs of society (or powerful groups within society). Marx makes such a statement when he asserts that the state is the managing committee of the bourgeoisie, or that the superstructure of capitalist society exists to stabilize the property relations of the economic structure. 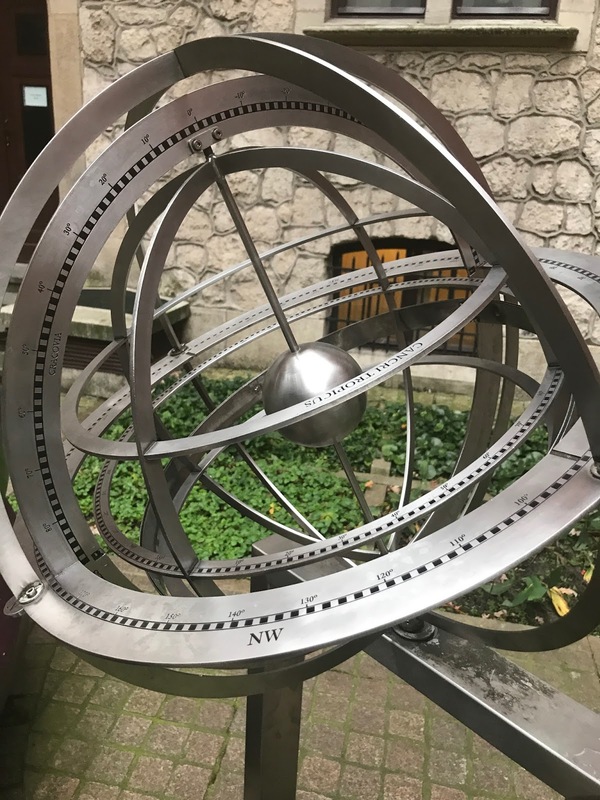 Jon Elster offered compelling critiques of functionalism in his discussions of Gerry Cohen's Karl Marx's Theory of History and Marx's theory of historical materialism (link). These criticisms were formulated with respect to historical materialism, but they are equally compelling for other functionalist theories as well. Fundamentally the critique of sociological functionalism depends on discrediting an analogy between biology and sociology. The language of functional adaptation of organs to system finds its origin in biology; the heart serves to sustain the organism by pumping blood. But, as Elster and others point out, there is a crucial disanalogy between biology and sociology. This is the fact of natural selection and evolution in the biological case, which has no close analog in the social case. We have a very good understanding of the mechanism that leads the physiology of a species to be well adapted to serving the reproductive and survival needs of the organism; this is the mechanism of natural selection. But social entities are not subject to analogous selection pressures. So the functionalist view of society is suspect because it depends on a fundamental mystery: how can the effects of a social features be thought to explain its emergence and structure? How can the fact that XYZ system of norms about marriage has the effect of creating a docile workforce explain the existence of that set of norms in society? Doesn't this get the temporal order of causation backwards? It is not impossible to provide answers to this question; but we cannot take it as a dogmatic assumption that society will unavoidably be organized in such a way that its needs are satisfied by well tuned institutions. There is one answer to this question that makes perfect sense: the mechanism of purposive design. There is no mystery in the fact that a rudder exists to steer the ship; it was designed by the ship builder to do exactly that. And perhaps it is no less straightforward to assert that the audit function in a corporation exists to prevent dishonest behavior within the organization. Intelligent managers, foreseeing the temptation to fiddle accounts, designed a system for detecting and punishing fiddling. What is more difficult to interpret is a claim about the social function of a feature where the postulated consequences of the workings of the features are obscure (latent, in Merton's terms), and where the feature took shape as the result of the independent actions of numerous actors over time. The first point makes intelligent design difficult to carry out, and the second makes it implausible to assume the existence of the intelligent designer at all. It is not impossible to imagine social mechanisms that might bring about a functional adaptation of a social arrangement to the needs of the system. Here is a mechanism that complements the intelligent design mechanism. Call it the "slow accumulation of interested adjustments" mechanism. Suppose that a social arrangement is introduced through legislation -- a policy governing regulation of private activities to protect health and safety. And suppose that the details of the policy are open to modification over time by a legislative process. At any given time there will be groups and individuals whose interests are affected by the policy. When modifications are considered, groups can advocate for improvements that favor their interests. And if there are groups within society that world disproportionate power and influence, we can expect that the modifications that are selected will more often than not be ones favored by this group. This mechanism implies that the policy will be "tuned" over time to work in such a way as to serve the interests of the influential group. This mechanism is different from the intelligent design mechanism because it assumes only local modifications over time -- not a unitary optimal planning and design process. It looks more like an evolutionary process -- myopic but directional. But the mechanism of innovation and selection is different from the biological case. Innovations survive because they are preferred by influential stakeholders. And the medium- and long-term result is a drift in the direction of fit between the working characteristics of the policy and the needs and interests of the influential groups. This gives us a different and more sociologically credible way of defending the idea that important social arrangements will be "functionally adapted" to satisfying the needs of the powerful groups in society -- not because those groups directly designed the arrangements, but because they had influence on the process of refinement and adjustment that led to the present configuration. This suggests that sociological functionalism is not fundamentally impossible. Instead, it shows that a functional claim must be complemented with an account of how the postulated correspondence between the characteristics of the arrangement and the needs of the system came to be -- how the arrangement was developed in ways that led it towards a higher degree of fittedness to the needs of some important social-systemic characteristic. When we think we know about an historical event -- the French Revolution, the Spanish Civil War, the Jim Crow years in America -- generally what we know is a limited and miscellaneous set of facts, impressions, interpretations, and summaries we have gathered through many avenues -- monographs, novels, films, poetry, historical lectures in college. No one now living has had direct experience of the French Revolution. And even if we came across a time-traveling Parisian from the relevant dates, we would probably quickly learn that this person's perspective on the events he or she lived through is highly limited and perhaps even misleading. What do most American adults know about the Holocaust? Here are some core beliefs that most people could probably recite. It was a horrible crime. It was a deliberate program of extermination. 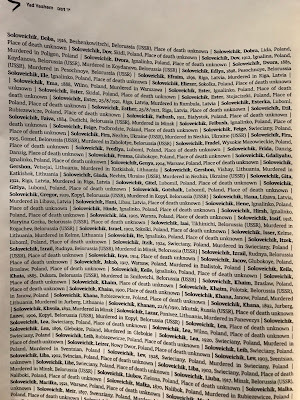 Over six million Jewish men, women, and children were murdered. Other groups were also targeted, including Roma people, homosexuals, and Communists. It was the result of racist Nazi ideology. There were particular agents of this evil -- Hitler, Himmler, Göring, Hess, ... There were countless ordinary people across the face of Europe, in Germany and many other countries, who facilitated this evil -- the "banality of evil". There were some heroes who fought against the killing -- Wallenberg, Schindler, Bonhoeffer, Marc Bloch, the villagers of Le Chambron. There are noted tragic victims -- Anne Frank, Maximilian Kolbe. And the Allies could have done much more to disrupt the killing and to facilitate escape for the Jews of Europe. But notice how thin this body of beliefs is. It is barely thick enough to constitute "knowledge of the Holocaust". It is encapsulated in just a few sentences. If it has emotional content it is a hazy version of the emotions of pity and sorrow. Is this knowledge adequate to the realities it represents? When we repeat the words, "Never again! ", do we know what we are saying? And how can a more full and satisfactory level of knowledge of this horrifying and defining event in the twentieth century be achieved? Here is one possible answer. 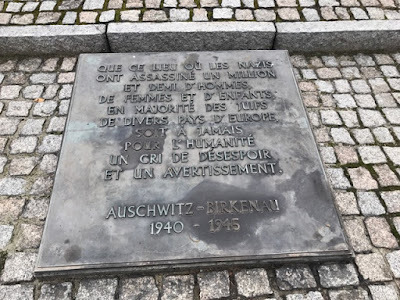 There is a different way of gaining a more personal and nuanced understanding of the Holocaust -- an extended visit to Auschwitz and Birkenau (link). It is a museum, an historical site, a killing ground, a place where one and a half million people were systematically murdered. A visit to the concentration camps is a very different avenue of knowledge -- knowledge through personal, empathic understanding of the vastness and horror of the crimes committed here. 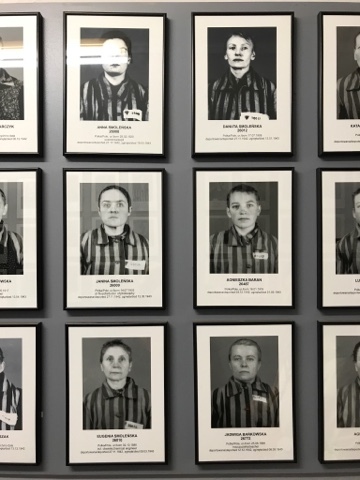 So, for example, one can see the photographs of individual prisoners, their life stories encapsulated by the date and place of their arrest and the date of their death in the gas chambers. One can read a very personal family tragedy in these photographs. There are mountains of human hair. There are piles of kitchen goods, shoe polish, clothing, combs, and other items of daily life, all carried through their final days of desperation and transit, all stolen from the dead. There are the drawings by child prisoners found on the walls of the barracks, depicting scenes of concentration camp life through the eyes of children. These children too mostly did not survive. 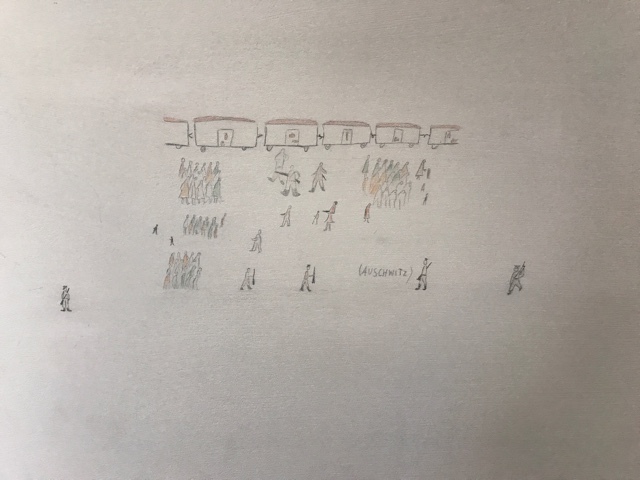 This drawing by a child depicts something the child must have seen -- the arrival of prisoners and their separation at the platform into those who would perform slave labor and those who would die immediately. So an intensive visit to Auschwitz is very powerful at the level of emotion and empathy. It makes the horror of the Holocaust both personal and particular. The visitor is led to imaginatively place himself or his loved ones on the platform, in the barracks, in the changing room. The Holocaust is no longer just a set of numbers and facts, but am invitation to vicarious empathic understanding -- and then a mental multiplication of that experience by a factor of millions. The museum and grounds of the death camps of Auschwitz-Birkenau receive over two million visitors a year, from dozens of countries. Some number of these visitors are perhaps unaffected by what they see. But surely large numbers of visitors are profoundly affected, and come to have a much more nuanced and personal understanding of what happened here. And surely this is a more important way of influencing our collective understanding of the Holocaust than any number of monographs. There is a practical consequence of this kind of more personal experience of an historical horror. 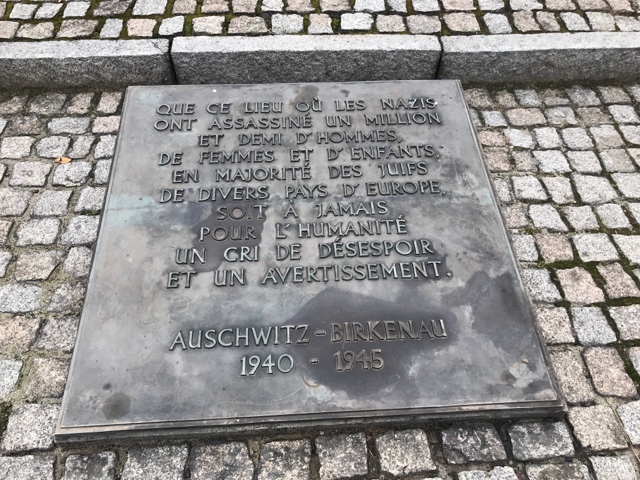 This experience strongly pushes the person to consider how the currents of hate that led to this historical crime are present in the world today. It leads one to care in a more particular way about the Rohingya people today, or about the resurgence of white supremacy and anti-Semitism in the United States at Charlottesville. And it brings one to see the danger implicit in anti-Muslim bigotry in the United States and other countries today. In other words, we may speculate that the more particular experience of the Holocaust afforded by a meaningful visit to Auschwitz contributes to creating a different kind of twenty-first century citizen, one who has a deeper visceral appreciation of what these crimes of the Nazi period involved in human terms, and a better and deeper understanding of the enormity of this experience. 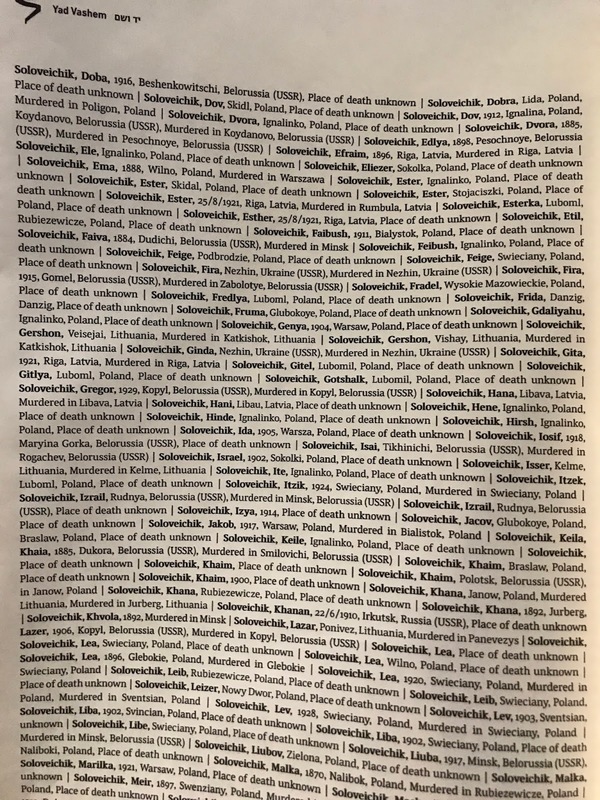 Equally important, it helps to create a much more specific emotional experience of pity and sorrow that honors the humanity of these millions of human beings who were murdered during this period. Consider some of the most intractable problems we face in contemporary society: rising inequalities between rich and poor, rapid degradation of the environment, loss of control of their lives by the majority of citizens. It might be observed that these problems are the result of a classic conundrum that Marx identified 150 years ago: the separation of society into owners of the means of production and owners of labor power that capitalism depends upon has a logic that leads to bad outcomes. Marx referred to these bad outcomes as "immiseration". The label isn't completely accurate because it implies that workers are materially worse off from decade to decade. But what it gets right is the fact of "relative immiseration" -- the fact that in almost all dimensions of quality of life the bottom 50% of the population in contemporary capitalism lags further and further from the quality of life enjoyed by the top 10%. And this kind of immiseration is getting worse. A particularly urgent contemporary version of these problems is the increasing pace of automation of various fields, leading to dramatic reduction for the demand for labor. Intelligent machines replace human workers. The central insight of Marx's diagnosis of capitalism is couched in terms of property and power. There is a logic to private ownership of the means of production that predictably leads to certain kinds of outcomes, dynamics that Marx outlined in Capital in fine detail: impersonalization of work relations, squeezing of wages and benefits, replacement of labor with machines, and -- Marx's ultimate accusation -- the creation of periodic crises. Marx anticipated crises of over-production and under-consumption; financial crises; and, if we layer in subsequent thinkers like Lenin, crises of war and imperialism. At various times in the past century or two social reformers have looked to cooperatives and worker-owned enterprises as a solution for the problems of immiseration created by capitalism. Workers create value through their labor; they understand the technical processes of production; and it makes sense for them to share in the profits created through ownership of the enterprise. (A contemporary example is the Mondragon group of cooperatives in the Basque region of Spain.) The reasoning is that if workers own a share of the means of production, and if they organize the labor process through some kind of democratic organization, then we might predict that workers' lives would be better, there would be less inequality, and people would have more control over the major institutions affecting their lives -- including the workplace. Stephen Marglin's 1974 article "What do bosses do?" lays out the logic of private versus worker ownership of enterprises (link). Marglin's The Dismal Science: How Thinking Like an Economist Undermines Community explores the topic of worker ownership and management from the point of view of reinvigorating the bonds of community in contemporary society. The logic is pretty clear. When an enterprise is owned by private individuals, their interest is in organizing the enterprise in such a way as to maximize private profits. This means choosing products that will find a large market at a favorable price, organizing the process efficiently, and reducing costs in inputs and labor. Further, the private owner has full authority to organize the labor process in ways that disempower workers. (Think Fordism versus the Volvo team-based production system.) This implies a downward pressure on wages and a preference for labor-saving technology, and it implies a more authoritarian workplace. So capitalist management implies stagnant wages, stagnant demand for labor, rising inequalities, and disagreeable conditions of work. When workers own the enterprise the incentives work differently. Workers have an interest in efficiency because their incomes are determined by the overall efficiency of the enterprise. Further, they have a wealth of practical and technical knowledge about production that promises to enhance effectiveness of the production process. Workers will deploy their resources and knowledge intelligently to bring products to the market. And they will organize the labor process in such a way that conforms to the ideal of humanly satisfying work. The effect of worker-owned enterprises on economic inequalities is complicated. Within the firm the situation is fairly clear: the range of inequalities of income within the firm will depend on a democratic process, and this process will put a brake on excessive salary and wage differentials. And all members of the enterprise are owners; so wealth inequalities are reduced as well. In a mixed economy of private and worker-owned firms, however, the inequalities that exist will depend on both sectors; and the dynamics leading to extensive inequalities in today's world would be found in the mixed economy as well. Moreover, some high-income sectors like finance seem ill suited to being organized as worker-owned enterprises. So it is unclear whether the creation of a meaningful sector of worker-owned enterprises would have a measurable effect on overall wage and wealth inequalities. There are several ways in which cooperatives might fail as an instrument for progressive reform. First, it might be the case that cooperative management is inherently less efficient, effective, or innovative than capitalism management; so the returns to workers would potentially be lower in an inefficient cooperative than a highly efficient capitalist enterprise. Marglin's arguments in "What do bosses do?" give reasons to doubt this concern as a general feature of cooperatives; he argues that private management does not generally beat worker management at efficiency and innovation. Second, it might be that cooperatives are feasible at a small and medium scale of enterprise, but not feasible for large enterprises like a steel company or IBM. Greater size might magnify the difficulties of coordination and decision-making that are evident in even medium-size worker-owned enterprises. Third, it might be argued that cooperatives themselves are labor-expelling: cooperative members may have an economic incentive to refrain from adding workers to the process in order to keep their own income and wealth shares higher. It would only make economic sense to add a worker when the product of the next worker is greater than the average product; whereas a private owner will add workers at a lower wage when the new worker's product is greater than the marginal product. So an economy in which there is a high proportion of worker-owned cooperatives may produce a high rate of unemployment among non-cooperative members. Finally, worker-owned enterprises will need access to capital; but this means that an uncontrollable portion of the surplus will flow out of the enterprise to the financial sector -- itself a major cause of current rising inequalities. Profits will be jointly owned; but interest and finance costs will flow out of the enterprise to privately owned financial institutions. And what about automation? Would worker-owned cooperatives invest in substantial labor-replacing automation? Here there are several different scenarios to consider. The key economic fact is that automation reduces per-unit cost. This implies that in a situation of fixed market demand, automation of an enterprise implies reduction of the wage or reduction of the size of the workforce. There appear to be only a few ways out of this box. If it is possible to expand the market for the product at a lower unit price, then it is possible for an equal number of workers to be employed at an equal or higher individual return. If it is not possible to expand the market sufficiently, then the enterprise must either lower the wage or reduce the workforce. Since the enterprise is democratically organized, neither choice is palatable, and per-worker returns will fall. On this scenario, either the work force shrinks or the per-worker return falls. Worker management has implications for automation in a different way as well. Private owners will select forms of automation based solely on their overall effect on private profits; whereas worker-owned firms will select a form of automation taking the value of a satisfying workplace into account. So we can expect that the pathway of technical change and automation would be different in worker-owned firms than in privately owned firms. In short, the economic and institutional realities of worker-owned enterprises are not entirely clear. But the concept is promising enough, and there are enough successful real-world examples, to encourage progressive thinkers to reconsider this form of economic organization. 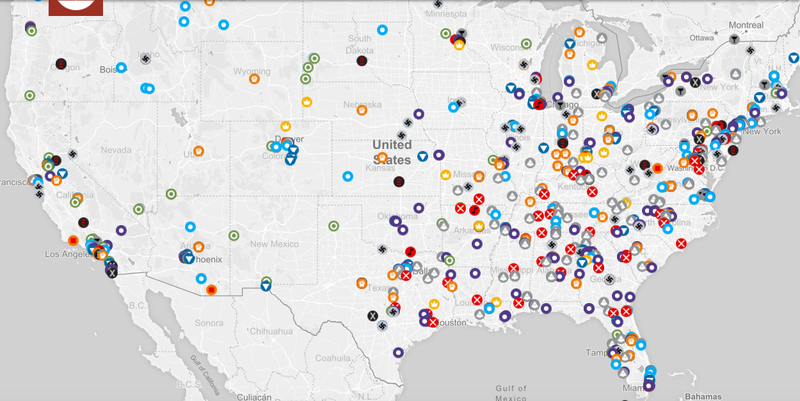 Through provocative epithets, slogans, and extremist demonstrations a variety of hate groups -- white supremacists, neo-Nazis, anti-muslim bigots, anti-immigrant activists, anti-LGBTQ extremists, and others -- are seeking to establish a broader foothold in various parts of the country. They seek to build distrust, hate, and antagonism towards various groups and to undermine the bonds of community that hold together the multi-ethnic, multi-racial communities that exist all over the country. We have also seen that social media can be used very intentionally by hate groups to cultivate mistrust, fear, and antagonism. This is an unsolved problem: Twitter, Facebook, and other social media are deliberately used to spread and cultivate hate. These facts are easy to observe. The question here is a harder one: what are some of the ways that organizations and individuals can resist the onslaught of division and hate? How can a multi-ethnic or multi-racial community inoculate itself against the spread and influence of hate? How can our communities maintain and increase their resilience in the face of this organized effort? Several things seem clear. One is that racist appeals generally seek to cultivate fear and resentment in their intended audiences. They work by cultivating mistrust across groups, framing the "other" as an interloper and a dangerous threat -- a threat to safety, to jobs, and to the hegemony of one's own group. And there is a logic of escalation that is implicit here. When the out-group perceives the growing antagonism and mistrust aimed towards its members, it is likely enough that individuals and organizations will become defensive -- and in their defensive actions they may provide more basis for the hate-based organization to extend its efforts. So how can a multi-cultural community prepare itself for these kinds of strategies of division and intolerance? It can work hard to cultivate cross-group knowledge, understanding, and trust. Progressive community-based organizations are key. When an ethnically-grounded CBO makes deliberate efforts to involve partners from other communities in its efforts, the organization furthers the knowledge of each other that is available to members of both groups, and it enhances confidence in both groups of the good intentions of the other. A higher level of knowledge across groups is an antidote to hate and mistrust. More deeply, a history of partnership, collaboration, and successful initiatives together provides a solid ground for confidence and trust across groups. Community leaders have a key role to play in enhancing the resilience of a community. When the mayor of a city is clear in his or her commitment to the equal value of all groups in the city, when he or she maintains a high level of community engagement through city offices, the various social groups in the city are enabled to develop a higher level of trust in the institutions that surround them and the values of respect and equality that their polity embraces. A mayor can be an important source of community cohesion in the face of divisive events and extremist efforts. 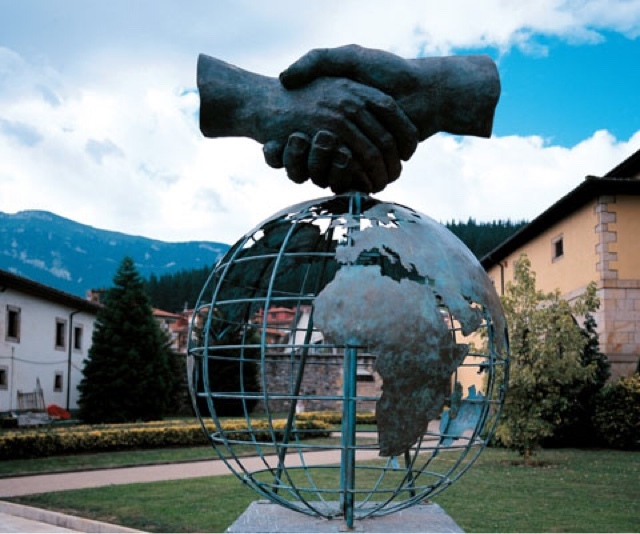 Leaders and organizations in civil society are equally impactful in maintaining an environment of trust and respect. Hospitals, universities, faith-based institutions, social-service organizations, and civic clubs all have the capacity to influence the values and behavior of large numbers of people. By being explicit and clear in their commitment to civility, respect, and equality, they can have a major impact on social cohesion as well. It is crucial that individuals, organizations, and leaders speak out when hate-based incidents occur. By doing so they signal their solidarity with the affected group, and they reaffirm the commitments of respect and equality that they have articulated in easier times. In the longer term, it is crucial to help children and adolescents understand the values of inclusion, respect, and acceptance of others. This means that it is very important for schools, places of worship, playgrounds, or youth organizations be attuned to the affirmative value of a democratic, multi-cultural society, and what goes into participating in an inclusive social world. Children are naturally open to each other without regard to differences; it is imperative to cultivate and extend that trust and mutual acceptance into adulthood. Each of these social forces have the potential for signaling and advancing a set of values of inclusion that provide a powerful buffer against the toxic workings of hate. And in the end, we have the ability to stand together and affirm the values of solidarity, mutual respect, and democratic equality that are anathema to the purveyors of hate. 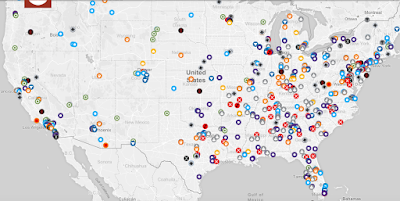 The Southern Poverty Law Center has compiled a report with some very useful strategies for combating hate at the community level; link. Here is a related post on social resiliency on Medium (link). Erik Olin Wright is one of the genuinely important contributors to a progressive sociology in the United States. He was one of the first wave of social scientists and philosophers who created the movement of analytical Marxism in the 1970s and 1980s, and for more than thirty years he has organized much of his own thinking and the collaborations of a number of other scholars around the idea of a "real utopia." Essentially the idea is to make use of good social science research and theory to help to formulate visions of the future of society that incorporate an emancipatory vision of human community while imagining institutions and social arrangements that are feasible and attainable. Erik's book Envisioning Real Utopias provides a manifesto and extensive development of the ideas (link). Erik agreed to have a conversation with me about the rationale and central convictions that underlie the real utopias project, and the discussion is a valuable contribution to some of the hardest problems of social and political life that we now face -- rising inequalities of wellbeing and opportunity and the emergence of a politics of intolerance, division, and hate. Thanks, Erik, for spending an afternoon with me thinking and talking about these important challenges. Progressives need new ideas and new imagination about what a future world can look like, and the real utopias project is succeeding in doing exactly that. Here is a link to the interview on YouTube (link). Readers who would like to view other interviews with innovative social scientists can click the "interview" page on the right (link).